On sale April 27 (Sat.) 2019!! ©BNP/BANDAI, NAS, TV TOKYO *Images may differ from final product. *Product may be subjected to change. Brand new series [Super Radiant Descent] begins! Fully include GranWalker Nexus card with new effects [Gran Force] and new cards [Saga Brave]! Upgraded 12 Zodiac Spirit cards included as 10th Anniversary X Rare can be used to strengthen [Galaxian] deck! 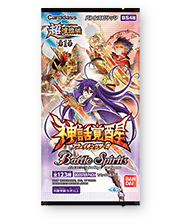 * The cards included in this pack may be used in official tournaments from April 27 (Sat.) 2019!. [CB07] Collaboration Booster Digimon Vol. 3 Let’s do this! Card Slash! Battle Spirits [CB02] Digimon Super Evolution !